Colorado Castle Investor Educational Retreat with No. 1 Stock Picker. Stocks and Bonds lost money in 2018. The smart money knew that 2018 was going to be a problem, and that the problems are likely to intensify in 2019 and 2020! Alan Greenspan warned that stocks were in a bubble and bonds are in a bubble on Bloomberg TV on Jan. 31, 2018. Warren Buffett admitted that he has $100 billion on the sidelines because stocks and bonds are overpriced. So, are you gambling with your future, trusting that the markets will just keep going up? “The only time in history going back to 1881 when [CAPE] has been higher are, A: 1929 and B: 2000. We are at a high level, and its concerning. This bull market, the longest in history, turns 10 on March 9, 2019. 2/3rds of economists polled by Bloomberg a few months ago predict a recession in 2020. GDP Growth came in at 2.9% in 2018 and is predicted to pull back to 2.3% in 2019 and 2.0% in 2020. So, what's your strategy for protecting your future and assets? Why not adopt a time-proven, easy-as-a-pie-chart nest egg strategy that earned gains in the last two recessions and outperformed the bull markets in between? That's why these strategies are enthusiastically recommended by Nobel Prize winning economist Gary Becker, TD AMERITRADE chairman Joe Moglia and over 120,000 people who have downloaded Natalie Pace's books and transformed their lives. neglect to follow simple and fundamental rules of the type provided [by Natalie]. This is why I recommend them with enthusiasm." "College students need this information before they get their first credit card. Young adults need it before they buy their first home. Empty nesters can use the information to downsize to a sustainable lifestyle, before they get into trouble." Joe Moglia, Chairman, TD AMERITRADE. and have outperformed the bull markets in between. Just ask Nilo Bolden. Click to access her video testimonial. Did you lose more than 30% in your nest egg in the Great Recession? Is your financial plan longer than 3-pages? Are you having trouble paying down debt or making ends meet? Are you spending more than $200 a month on health insurance, life insurance, utilities or gasoline? Would you like to protect your nest egg and save thousands annually in your budget with smarter choices? Investor Educational Retreat, and a lot to lose if you don’t. Here Is What You will learn. * What's safe and how to get safe in a world where the economy today is more vulnerable than it was in 2008 or 2000. * To educate your teens on how to get an employable degree from a great university for half the price. * Debt reduction strategies that work faster than any other fix. In addition to all that you will learn and master, you will be experiencing the rich life at Castle Marne, learning the strategies of the rich, while you experience the royal treatment. It's important to remember that in the last two recessions, most people lost more than half of their retirement. Stocks lost more than 55% in the Great Recession and more than 78% in the Dot Com Recession before that. It took NASDAQ 15 years to crawl back to even from its highs in 2000. When you lose more than half, it takes 8-10 years to crawl back to even, so if you're losing half or more every 8-10 years, you're just riding the Wall Street rollercoaster. That's why Buy & Hope doesn't work in today's world, and Natalie Pace's easy-as-a-pie-chart nest egg strategies do. Over 10 million homes went to auction in the Great Recession. Real estate prices, consumer debt, public debt & stocks & bonds are all higher than they were before the Great Recession. Getting safe, protected and hot costs less time and less money than most people spend. Learn the ABCs of Money that we all should have received in high school. If you wait for the headlines, it is too late to protect yourself. The Feds didn't admit we were in the Great Recession until Oct. of 2008 -- after the Dow had dropped over 6000 points! Stop making everyone else rich at your own expense (yes, even if you're in debt). Stop riding the Wall Street rollercoaster. Start preserving your assets and providing for your future. Live a richer, less stressful life. Enjoy more bucket list vacations! 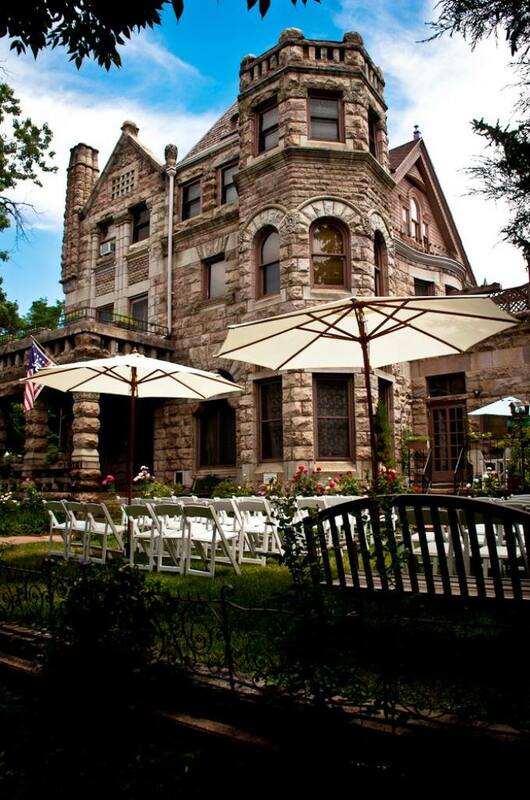 The Colorado Castle Retreat in Denver at the Castle Marne on April 27-29, 2019 will feature an intimate boardroom setting, limited to just a dozen attendees. You'll have experienced volunteers on hand. The time-proven solutions will be hands-on, taught by Natalie Pace personally. It all begins with learning the ABCs of Money that we all should have received in high school. Join us to discover just how empowering wisdom is! 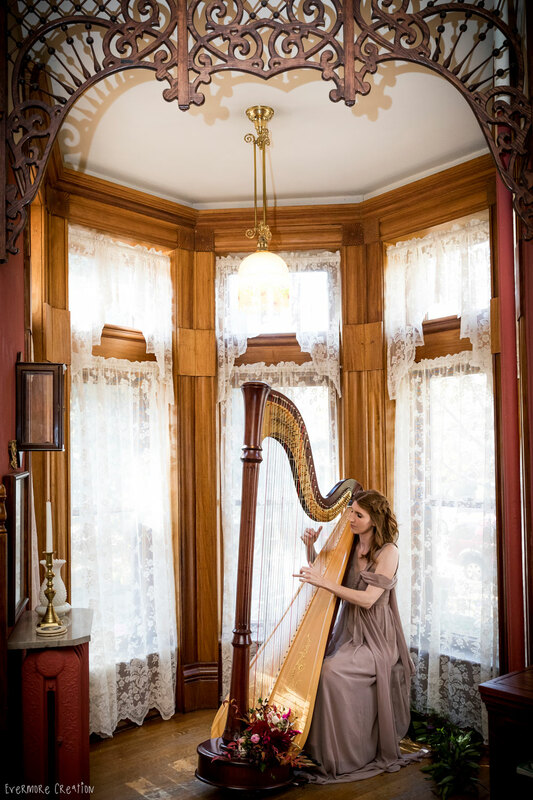 "I doubled my nest egg with Natalie's picks!" Anita. This is an intimate retreat in a boardroom setting. Limited availability! Our retreats almost always sell out by the Early Bird deadline. Call 310-430-2397 or email Heather@NataliePace.com to register NOW. Our retreats almost always sell out by the Early Bird deadline. Call 310-430-2397 or email Heather@NataliePace.com to register NOW! PLEASE NOTE: Lodging, food, transportation, parking, etc. are not included in the retreat price. No cancellations after Dec. 23, 2018. No refunds. Processing fee of $295 per attendee will be charged for cancellations before Dec. 23, 2018. Call 310-430-2397 to Register Now. PRIVATE PROSPERITY COACHING, one-on-one with Natalie Pace: April 30, 2019 (Call 310-430-2397 for pricing and to reserve). Easy as a pie chart nest egg strategy that outperforms in bull and bear markets. What's Safe & How to Get Safe in a Debt World. Why your "safe" investments could be at risk of losses and illiquidity. Debt Reduction Strategies that work exponentially faster than any other fix. How to protect your assets from the tax man, debt collector, utility bills, gasoline station, insurance salesman and other financial sinkholes. How to earn 30+% more in your stock portfolio instantly. The Hottest Assets, Industries, Companies and Funds for 2019 and beyond. Why New Chips are safer than Blue Chips. Safe hard assets that provide income and put money in your pocket. How to profit by putting your money where your heart is. How to be the architect of your dream life and hire Dream Come True Financial Partners. Great gains while you sleep. Maximizing nest egg gains on auto-pilot, through rebalancing and limit orders. Call 310-430-2397 to register NOW! Natalie Pace's easy-as-a-pie-chart nest egg strategies earned gains in both of the last two recessions and outperformed the bull markets in between. She was named the #1 stock picker, above 830 other A-list pundits by an independent tracking agency. 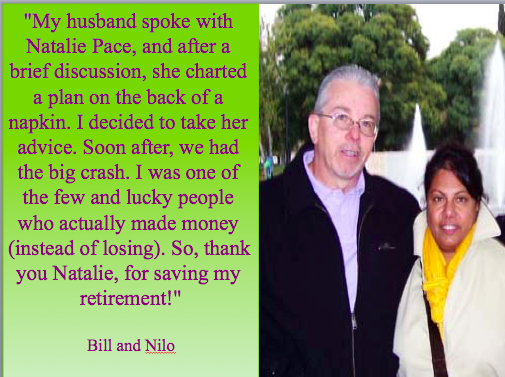 Natalie Pace has also been saving homes and nest eggs since 1999 with her Thrive Budget. In 2001, Natalie Pace almost tripled her stock investments by accurately predicting the Dot Com Recession (in 1999) and then investing strategically in undervalued businesses. NASDAQ investors lost 78% between the highs of 2000 and the low of Oct. 2002. In 2005, Natalie Pace was ranked #1 stock picker, above over 830 A-list pundits, by the independent tracking organization TipsTraders. In 2008, Natalie Pace warned of the coming Great Recession. Those who heeded the warning and employed a few easy, effective strategies earned gains, instead of losting more than half of their retirement. In 2016, two of our hot funds doubled. Almost half of Natalie Pace's Company of the Year companies have doubled or more. Many have enjoyed astronomical gains! If you save 10% of your income in a tax protected retirement plan and that earns a 10% gain (what stocks and bonds have done for the past 30 years), you'll have more money than you earn in 7 years and your money will earn more than you do in 25 years. If you're not doing this, you're making the taxman, the debt collector, the landlord, the utility company, the gas station, the bank and more rich at your own expense. Wisdom is the cure! REGISTER BY Nov. 30, 2018 TO RECEIVE THE LOWEST PRICE AND A FREE PRIVATE, PROSPERITY COACHING SESSION (VALUE $300) WITH NATALIE PACE. ​CALL 310-430-2397 OR EMAIL INFO @ NATALIEPACE.COM NOW. Lodging Costs vary by room. Castle Marne is giving our guests 30% off the regular price! 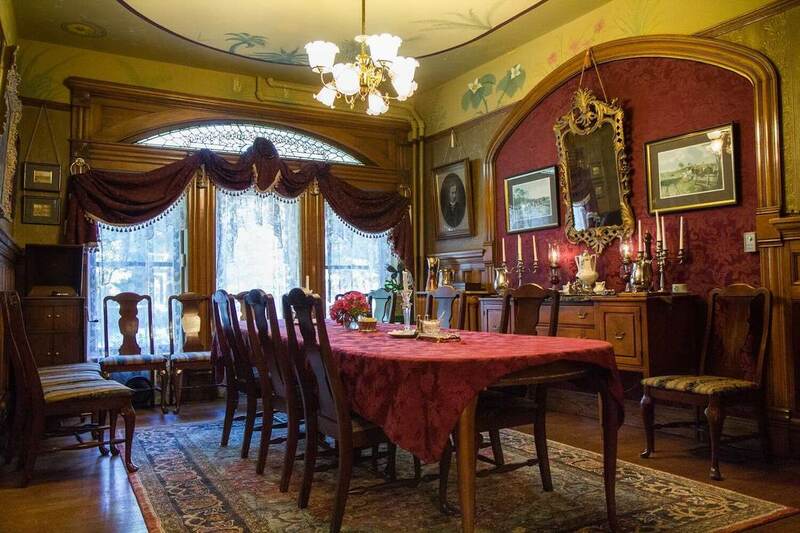 The Castle Costs include taxes, complimentary gourmet breakfast, afternoon sweat tea and an evening nightcap of cookies and tea. Visit NataliePace.com to learn more.